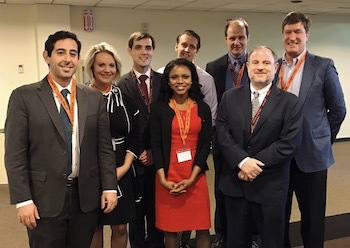 Several CSLR faculty, fellows, and students presented papers at Religious Critiques of Law, a conference presented by the Herbert and Elinor Nootbaar Institute on Law, Religion, and Ethics at Pepperdine University. CSLR Director John Witte, Jr. presented, "Law and Protestantism: The Legal Teachings of the Lutheran Reformation;" CSLR Director of Programs and Professor Michael Broyde presented, "The Case Against Religious Arbitration;" and Keisha T. Russell (JD 2017) presented, "The Christian Due Diligence in Liberating Education." Also presenting were: Mark Goldfeder, who directs CSLR's Religious Freedom Restoration Project; Shlomo C. Pill, CSLR Post-Doctoral Fellow in Law and Religion; Paul Zwier, CSLR Fellow and Professor of Law; Joel A. Nichols, CSLR Fellow and Associate Dean for Academic Affairs and Professor of Law at University of St. Thomas School of Law in Minneapolis; Kurtis Anderson (JD 2017); Anton Sorkin (JD 2017); and Ashley Barnett (LLM 2017).